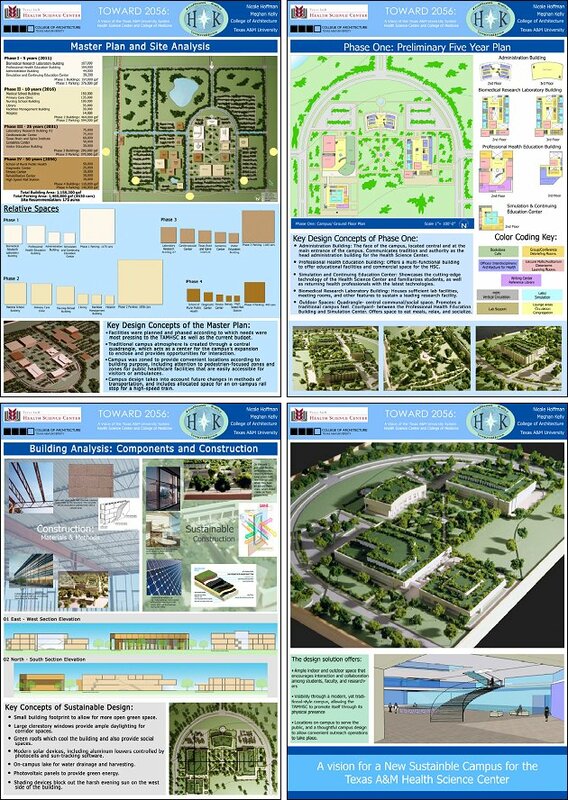 A unifying, physical manifestation of the HSC in the form of a campus master plan, including phased plans for expansion. The Texas A&M Health Science Center (TAMHSC) is a system composed of multiple, educational branches of medicine and health sciences, housed in different locations across the state of Texas. In an effort to assist the needs of the TAMHSC our main goal was to create a vision for a campus, planned in phases, to allow for future expansion, as well as design plans in the next five years. Promote interaction and collaboration among faculty, students, and researchers. Create visibility and self-promotion through a campus. Allow outreach through patient-care accessible to the community. Provide cutting-edge educational and research facilities. After carefully considering the goals of the HSC, we created a vision for the campus, putting special emphasis on spaces for interaction, technology, and sustainable design. In the creation of a master plan for the campus, we phased the expansion of the HSC in increments of five, ten, twenty-five, and fifty years. We allocated space for future buildings, minding the issue of zoning and convenient or sensible locations for each building according to its purpose. The campus layout is intended to convey a traditional “campus” environment, including a central communal outdoor space in the form of a quadrangle. The semicircular entrance of the campus also conveys its relationship to the current campus of Texas A&M University, which we assumed would be relatively close in its geographical proximity. We took time to estimate the square footages of all the buildings in each phase, which allowed us to provide an estimate of total acreage that the TAMHSC should acquire for its campus and the future expansion it will undergo. Administration Building: The “face” of the campus. The architectural design conveys a modern approach to a visual reference to the traditionalist architecture of the A&M campus. Professional Health Education Building: Houses an auditorium, lecture halls, classrooms and learning rooms, as well as a café and bookstore to provide a commercial opportunity for the TAMHSC. Simulation and Continuing Education Center: Provides a facility of cutting-edge technology to help keep students and returning health professionals up-to-date on the latest in health care technology. Holds simulation labs, debriefing and group rooms, and computer facilities. Biomedical Research Laboratory Building: Contains sufficient lab space, researcher offices, classrooms, auditorium, and lecture halls. This building would act as the main laboratory research building and offer state of the art facilities for educational and research purposes. These preliminary buildings of the campus are arranged to create the initial quadrangle outdoor space in the center of the campus to provide a main social space, which would continue to be central as the campus expands around it. This grand communal space would encourage socialization and chance encounters among those on campus, therefore promoting interaction and collaboration. We also made an effort to pursue sustainable design in our campus planning and building design by use of: photovoltaic panels, solar devices controlled continuously by photocells and sun-tracking software, a drainage lake, and green roofs (that also offer social spaces).